It is my last morning of sitting in bed with a large coffee and cream. The end of an era. Time to shake things up. Try something new. I might return to this habit in 3 weeks time, I might not. Tomorrow morning, I start a 3-week cleanse. I am using the principles outlined in the book called “Clean”, by Dr. Junger M.D. I borrowed his book from the library and am going over to my local “Choices” grocery store to procure some of the more unusual recommended ingredients. However, I am choosing to use food as the main ingredient. No powder drinks, no supplements, just a wide variety of fresh food. I am really crowding out the space on my plate where all the potential irritants are sitting. (Cleanprogram recipes are available for free online). This idea started in June of this year with the purchase of a cookbook. (Ahh, the feeling of acquiring a new cookbook) And, I have been intrigued to know more about the food sensitivity to gluten, so many people have. So when Gwenyth Paltrow was smiling out at me in such a happy, clean and bright way, I had to know more. This is where I first learned about the long list of processed foods that cause digestion problems. So many common and irritating ailments are a sign of poor digestion. (Who knew?) As each new “health type problem” was added to my running list, I just assumed these were signs of getting older. New and not exciting signs of ways that my body was betraying me. And that I was doomed to accept these forever more. I had thought, up until that time, I practised a pretty healthy diet. But, if I looked closely, took the time to learn a few new things, it was surprising to uncover a some rather unhealthy habits. My kitchen cupboards contained a whole lot of processed food ingredients. I was then combining them all together, with a bunch of time and effort to create a home-made version of what was available at the store. Sure my baked goods had slightly less sugar in them, maybe a few bits of grated carrots or zucchini thrown in, but they were essentially a processed food. When the main ingredients are finely milled flour + processed sugar + butter, it is hard to say that is a going to produce a healthy product. Once I looked beyond the big food manufacturers widely available at every grocery store, there is a small, (but growing quickly), and secret door into a world of TRULY healthy and tasty options. Every time I shopped for groceries I challenged myself to try a few new ingredients. So I became to experiment with coconut oil, chia seeds and cocao. My children know what agave nectar, stevia and mulberries are. I began to find sweetness in vegetables. Evidently, we have become accustomed to expect a very high level of sweetness in our food. High fructose corn syrup is present in a wide variety of processed foods. As the name indicates, it only requires a small amount to yield a highly sweetened result. As I shifted away from adding sugar or ingredients containing sugar, I started to really enjoy naturally sweet vegetables. Home made milk alternatives ROCK. I have never enjoyed the feeling of drinking milk. I had long suspected it created excess mucus, and it does! But a freshly made almond milk with a touch of vanilla, still frothy from the blender is amazing! Needing caffeine to get going in the morning is not good. I have long thought this, but have so enjoyed the feeling and rush it gives. As my husband and I have experimented with smoothies in the morning, first thing, we have forgotten to drink the coffee afterwards. Maybe because the smoothie is filling and leaves a feeling of satisfaction, different from coffee. Substituting flour with my home-made almond milk, flour-like leftovers has given us the most amazingly moist, rich and gluten-free muffins. I am throwing in all kinds of fresh or frozen fruits. The experimentation has only just begun. More on this to follow. I just got from the library, (after paying over $20 in fines! Travel to Oslo wreaks havoc on my library routines), “babycakes“, by Erin McKenna. A gluten-free New York City bakery I have heard about and will be trying in November. It will be an interesting journey, for sure. I am going to keep a detailed daily journal. I’m not sure how much of it will make its way to this blog. I have read that this journey will be profound. The changes will happen on many levels and effect every part of me. Probably more information than anyone else needs to know. My husband will suffer all the details like a champion. My children will probably only question why I need to “drink” my dinner each evening while they enjoy a proper “chewing” meal. But I am excited. This is not a diet-to-loose-weight kind of thing. Everything has led to this moment. At age 43, I am finally ready to formally commit to a healthier way of living. My children are young enough to benefit greatly from this effort. I will set them free in the world with an abundance of great recipes, happy memories and the enthusiasm for life that comes from the foundation of good health. Check out the website for Clean. When I was young, the family meal at dinner was always a buffet. My Mother’s instructions were that you had to try a little of everything. Once that was accomplished, second pass was whatever you wanted, or whatever was left. By default, we got most of what we should be eating and least of what we shouldn’t, because the meal was designed that way. Now that I am at the helm of meal planning, it is very difficult to make sure we are all getting the correct balance. Made more challenging with one super picky eater, one semi picky eater and 2 of us that will eat just about anything. The picky ones prefer vegetables to be raw, if at all and I draw the line at eating the same few things, day after day – without any novel preparations. So that leaves me to constantly be on the search for new recipes. I’ll come across a book with great tasting things, good balance of food groups, but the attention to grams of fat is non-existent. Or I’ll find a low-fat book that seems like a good idea on paper, but the taste is not there. And then I already have a plethora of books focusing on cuisines from far away lands, requiring much time and costly ingredients. Tonight I had a great idea. The food stuffs had to be local, (beets, potatoes, Italian sausage) or already present in my kitchen. What do I call this? 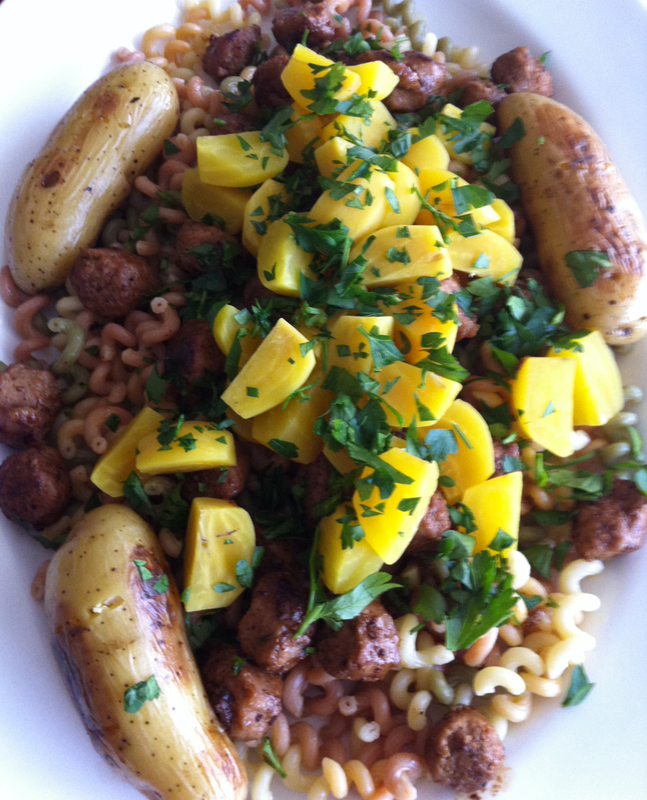 Pasta hugging sausage bits with fresh fingerling potatoes and yellow baby beets. Too wordy I think. Boil the potatoes slowly in salted water in a non-stick frying pan. Once cooked through, drain off most of the water and add the olive oil. Keep the lid on askew and toss the potatoes until they are golden and crispy. In a small saucepan, boil the beets in salted water until they are el dente. Drain off water and squeeze over lemon juice. Boil pasta according to package instructions. Drain off water, add garlic and oil, stir. Remove casings from sausage. Cut into rounds. Fry in a little olive oil with the oregano and paprika, until golden. Add balsamic and some water to make a little gravy from the brown bits in the pan. Assemble in layers with pasta first, then sausage, then beets and parsley on top. Potatoes place on the edge. To the portions – maybe not quite enough vegetables. But a much better balance than what we have been used to. And for my family, better than if each item was on its own. But most important, it tasted great and everyone liked it! A vegetable eaten and enjoyed is better than one left on the plate.